Dual elastomer ULTRA-VANSHIELDÂ® shielding gaskets feature continuously extruded high-strength silicone rubber core; co-extruded conductive metal-filled silicone outer layer; no compression set; and low compression force. Gaskets consist of two symmetrical contact bulbs, one with conductive outer layer to make contact between mating surfaces and the other dedicated environmental seal to allow for single piece construction to deal with dust and moisture sealing as well as EMI shielding. Vanguard Products Corporation announces the addition of specially engineered gasket profiles to its patented Ultra-Vanshield product line. Our dual elastomer ULTRA-VANSHIELD® is definitively the unique solution to emi shielding applications. 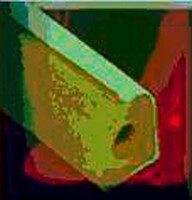 Each style incorporates design features not commonly found in other forms of shielding gaskets such as: a continuously extruded high-strength silicone rubber core; co-extruded highly conductive metal-filled silicone outer layer; extremely high shielding effectiveness; no compression set; and low compression force. These new profiles consist of two summetrical contact bulbs - one with a conductive outer layer to make contact between the mating surfaces. The other is a dedicated environmental seal, normally installed with the environmental segment closest to the source of outside influences, thus allowing for economical single piece construction to deal with both dust and moisture sealing, and EMI shielding. About Vanguard: Founded in 1963, Vanguard's focus has been on engineered high performance elastomers. We specialize in extrusions, coextrusions, moldings, cut parts and custom assemblies for most industrial markets, including: aerospace, aircraft, appliances, architectural, automotive, electrical, electronics, food processing, hydraulics, instrumentation, machinery, marine and medical. 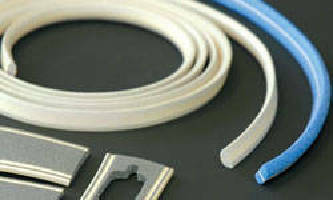 EPDM Gasket helps maintain reverse osmosis systems.